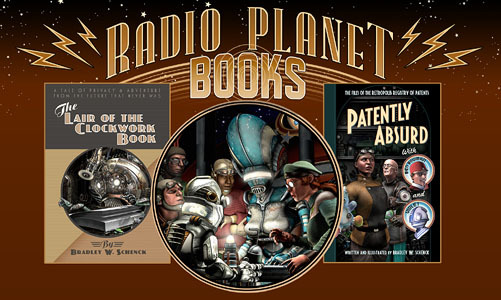 I’ve spent the last two weeks on two projects: rebuilding part of my front porch (which you probably don’t care about unless you’re knocking on my door), and creating a phone-friendly redesign of my Retropolis web site. I’m not crazy about the ways that phones have affected web page design – and I really miss my old page layouts – but because I am also not actually crazy I finally caved in to peer pressure and converted the site into something that works well on phones. Mostly. The big exception is the Business Card Construction Kit. You still need a much wider browser window to do much with that one. But in every other respect you can now shop quite comfortably even on one of those tiny, ridiculous devices that you all use. So go do that, please, while I dart outdoors between the rainstorms and try to get my deck boards nailed down in time for Winter. As always, you can find the Retropolis Transit Authority T-shirts, along with posters, greeting cards, postcards, business cards, and other things that are not cards. Like, uh, coffee mugs. And books. And other stuff. Go get ’em! 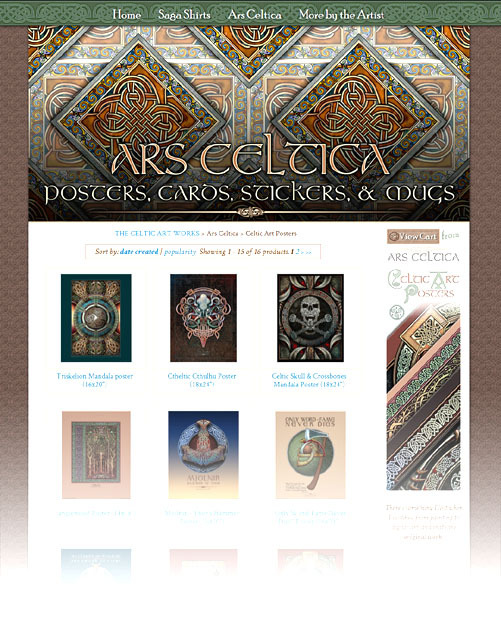 I’ve been selling customizable business cards for several years now at Retropolis and The Celtic Art Works. Customers would click on a sample image and be carried over to the Zazzle site, where they could edit the text on that card design to their own specification. The system worked pretty well, and a lot of people bought their business cards that way; but I’ve always thought it could work better. 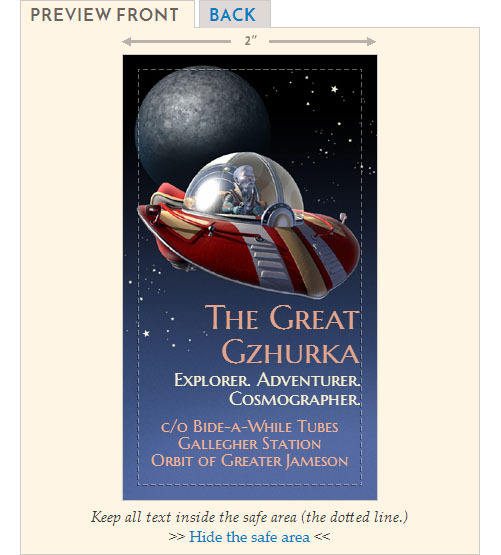 After I built the Pulp-O-Mizer I could even see how it might be better: if all the possible background images were available in menus, and the whole user interface worked a bit more like the Pulp-O-Mizer, I figured that the process would not only be more fun, but more engaging. Customers would be able to try out all sorts of possibilities… so they would. They’d be more likely to buy their cards once they’d invested their time in them. It could work out better for all of us. But it wouldn’t be a small job, and I’d need a fair-sized block of time to work on it. As it turns out, the job took about a month. It’s alive! Alive, I tell you! 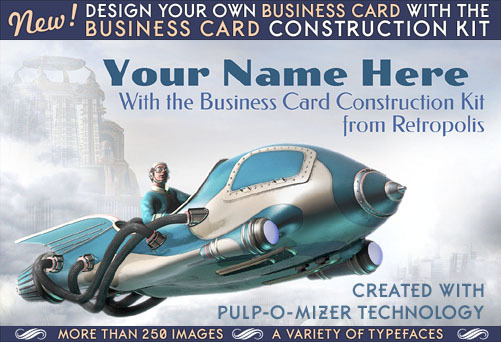 The Business Card Construction Kit includes much of what the Pulp-O-Mizer does, but it also does more. 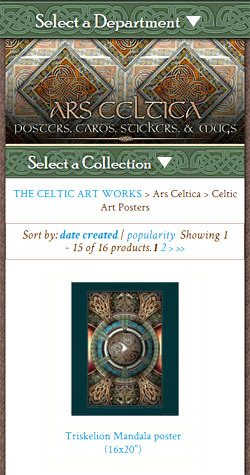 You can design a business card in either horizontal/landscape or vertical/portrait shapes; you can have images and text on both the front and the back of the business cards; you can select any colors you like for your text; you have over 250 background images from which to choose, along with a wide variety of typefaces; and I’ve made innumerable little improvements to the user interface and user feedback. It’s a pretty nice system! 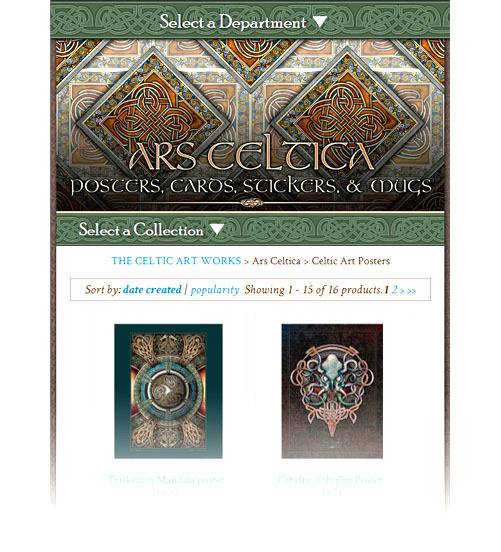 There are a lot of Retropolis images, of course, but I’ve included all the old Celtic card backgrounds from The Celtic Art Works, and then added a lot of new border designs and images in that style. And I can continue to add more designs and styles as time goes on. Both the front and back of your business card can have up to six different areas of text, each with their own controls. 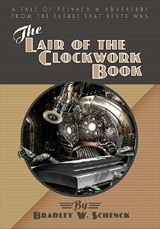 The color selector is something that I decided to leave out of the Pulp-O-Mizer, but it makes a lot of sense here. And because there are so many typefaces available in the Business Card Construction Kit I’ve given you a second menu, which you can use to filter the typeface list by font type: Serif, Sans Serif, Hand Lettered, or All. 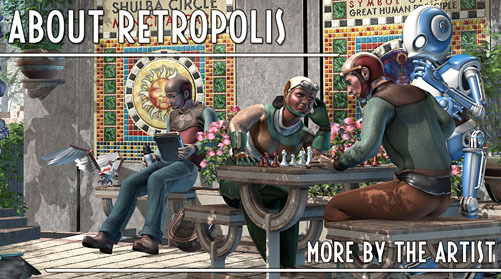 In order to save, move, or share your card designs, you get the same options as you do in the Pulp-O-Mizer. You can save and load locally, or you can export your card data as a block of text that can be imported into the Construction Kit on another device or browser. There’s also a menu of example designs that you can load, and learn from, and even use as the basis for your own business card. So that’s what I’ve been working on. I think it’s a much improved system for buying your customized business cards, and it’s designed to grow, as well. Give it a spin! Because they’re meant for the web, there are very few frames. I have to allow enough time after the page loads, and before the animation plays, for all the frames to get loaded. For that reason there’s a very simple animation that plays first, and there are only two animations on each page. There are usually two things going on in each animation. There’s a primary motion that carries the element around the page, and a secondary action that’s sometimes a limited animation within the element, and sometimes a special effect. 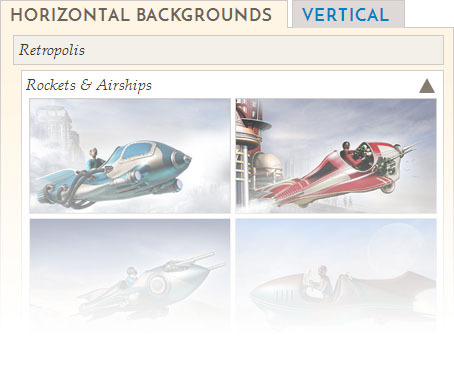 The site’s page layout responds to the browser window’s width and it changes any time the window’s resized. That did lead to some conceptual weirdness. I can’t predict how large the browser window is, or whether its size may change between one frame and the next. In some cases I had to deal with unexpected outcomes when I resized the browser. Everything seems to work now. 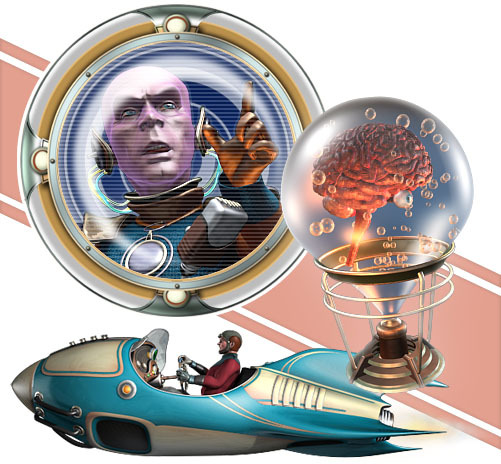 There’s just one case – an element that travels along an arc – in which phones may have trouble keeping up with the frame rate. I can’t test that because I don’t use a mobile phone. But the math in that one instance is fairly intense; I don’t think any of the other animations will present a problem. And I may even do one or two more before you get a chance to see them. But, honestly, this was just a twelve-day obsession. I really ought to be working on something else. It’s just that it’s nearly impossible for me to leave something alone when it almost, almost works.